While our Los Angeles, Beverly Hills ridge preservation expert makes every effort to preserve natural teeth in order to keep your smile healthy, some teeth may need to be extracted. Extraction may be necessary due to abscess, decay, dental trauma or gum disease. Unfortunately, significant resorption of the bone tissue can begin immediately. The bone tissue breaks down and shrinks. In some cases, the tissue breaks and shrinks dramatically, while in other cases, the process is slower and steadier. If you are a candidate for a dental extraction, our expert in ridge preservation in Beverly Hills may recommend ridge preservation during the extraction process to limit the potential damage. Once the tooth has been extracted, the bone around the socket tends to collapse, which makes the ridge thinner and narrower. Eventually, the bone itself will collapse. This process can be accelerated by external factors, including traditional denture use. We can explain all your options while we are creating your treatment plan. We may be able to place a bone graft at the time of the extraction, which limits the tooth loss and minimizes the need for future bone grafts. Our expert in ridge preservation in Beverly Hills, Los Angeles may also recommend placing implants after your dental extractions. Dental implants fit into the jawbone just like the natural teeth do and help protect the bone tissue. The bone graft materials used in ridge preservation offer support and stability to the tooth socket, but it is not a permanent solution to bone loss after extraction. For best results, most patients will need to have their dental implants placed no later than four to 12 months after the initial extraction. If implants are not placed soon enough, the bone can continue the resorption or deterioration process, and another bone graft may be necessary. OurBeverly Hills ridge preservation expert can help you determine the best options for your treatment needs. If you need a dental extraction or have already had a dental extraction, we can help. Contact our office today to find out more or to schedule your consultation with our Beverly Hills periodontist. 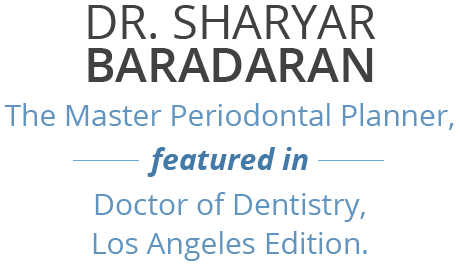 Dr. Sharyar Baradaran is a top-ranked dentist and periodontist, providing state-of-the-art care for patients in and around Beverly Hills, CA. At his practice on Camden Drive, Dr. Baradaran offers the most advanced care options for patients facing an array of oral health issues and concerns, including routine cleanings and advanced dental hygiene treatments, periodontal surgery, gum disease care including root planing and scaling, gum surgery including gum contouring and gum grafting, bone grafting, and skilled dental implant placement, as well as cosmetic treatments like Zoom teeth whitening treatments, veneers, and comprehensive smile design and makeover treatment plans. Dr. Baradaran attended the University of California, Los Angeles Dental School from 1988 - 1992 while also completing his Masters in Oral Biology from UCLA in 1992. Dr. Baradaran furthered his professional training, completing two additional years of surgical training at Oregon Health Sciences University from 1992 - 1994 focusing on dental implants and the treatment and management of gum disease, the leading cause of adult tooth loss in the U.S. Since founding his practice in August 1994, he has become recognized as a leading oral care treatment provider in Beverly Hills, CA, and throughout the Greater Los Angeles area. Dr. Baradaran is committed to providing each patient with individualized care that focuses on their unique oral health needs as well as their personal objectives. His mission is to provide each patient with the oral health solutions they need, from the treatment of decay and disease to the creation of more beautiful, aesthetically pleasing smiles. His office is equipped with the latest technology so patients can have the broadest array of treatment options and experience optimal results with minimal anxiety. Dr. Baradaran welcomes new patients and enjoys creating long-lasting professional relationships based on respect and a dedication to helping patients get the care they need for better oral health at every age. The office is conveniently located and the practice accepts most major forms of dental insurance. Dr. Baradaran offers the Zoom teeth whitening system for patients in the Beverly Hills, CA area who want to banish yellowing and stains and enjoy whiter, brighter smiles.